First off, if you’re here looking at how-to-engagement pictures, you must be engaged so let me say CONGRATULATIONS! 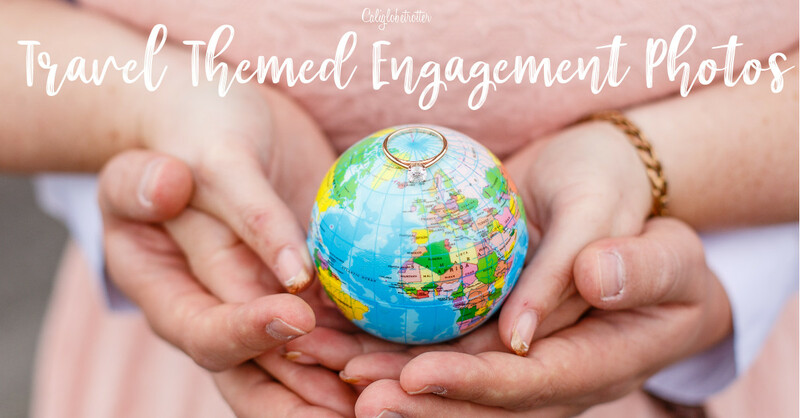 If you’re not engaged (yet) but you’re brainstorming ideas for an upcoming engagement, then you’ve come to the right place! 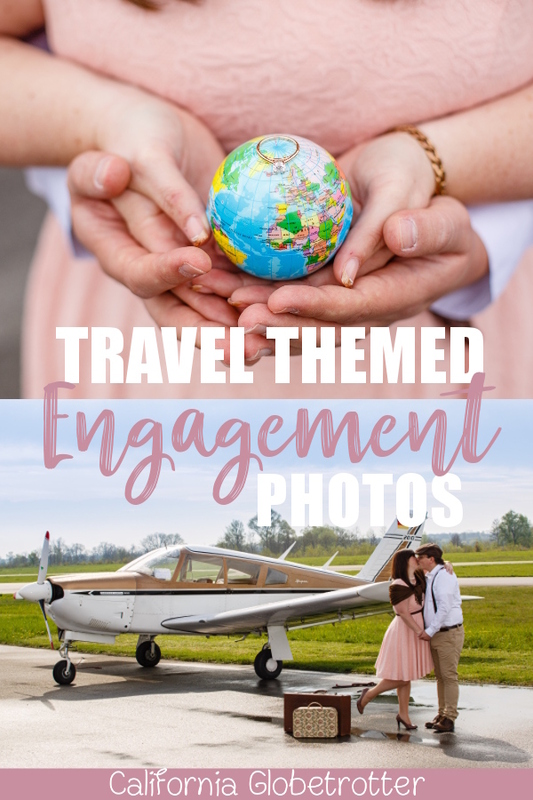 Especially if you’re a die hard travelholic and want to include travel into your engagement announcements and want to WOW your friends and family! Getting Hitched? PIN IT FOR LATER!! Taking engagement pictures has evolved way so much since the time my parents go remarried in the late 90s. It was more about taking a simple picture to celebrate your engagement. Back then, as far as I know, there was no such thing as a “Save the Date” card or engagement announcements. And there was certainly no Facebook to send out electronic announcements or change your status. You generally found out people were gettin’ hitched when you got the wedding invitation in the mail. 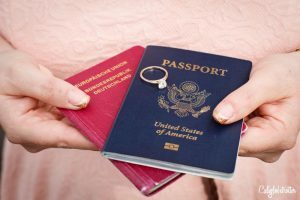 I personally have suffered from severe wanderlust my whole life as I was practically born traveling, so it comes as no wonder that when my engagement finally arrived, I knew right off the bat I wanted to include travel into our engagement/wedding somehow. 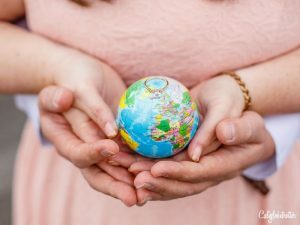 So, what are some travel themed ideas you can use for your Engagement/”Save the Date” Announcements? We personally chose to do #1 as to me personally, nothing implies “travel” more than an airplane. And not just any airplane, but small planes and vintage looking planes. Airplane travel photos are quite unique in terms that I felt it was different from anything most people tend to do and it’s not every day you can take photos next to vintage planes. How were we able to take pictures at the airport? Simple! 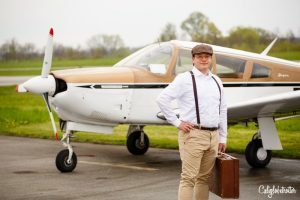 We found a small local airport within a half hour of us and contacted them via e-mail asking if we would be able to take pictures at their airport, on the tarmac with some old planes. Within a few days, we got a positive response. Turns out, the man in charge was the head of an aviation club at the airport, so he let us use the planes in the backdrop. A small donation to the club as thanks was enough. No other charges. Travel Accessories You Need to Make Your Pictures Great! Anything and everything travel related! We went crazy! I seriously couldn’t stop coming up with ideas! I even added a few vintage umbrellas and hand made a wedding date ribbon banner as well as some other special props! How Should You Dress For Your Engagement Pictures? To each their own! We went vintage as we felt that went best with vintage planes. Plus, I’m an old-fashioned kind of gal and would have loved to live in a time when women wore nice dresses and hats and the men wore suits & tie and top hats. Buut we didn’t go that vintage! We did however want a bit more vintage style than we got. It was actually quite difficult here in Germany to find a brown vest for my fiance, especially in brown for a reasonable price. We searched everywhere and the most common colors were black and grey. Ugh. So we settled with suspenders and a newsie hat. I settled with a dress in light pink, pearls and pumps. I added the shawl to the outfit as I thought it would add class to the pictures. I think I could have done without that bit. Is Only One Location Necessary? Heck no! We did 2 different days of taking photos in two different locations. I also wanted to have travel themed pictures walking through a town as if we were tourists. 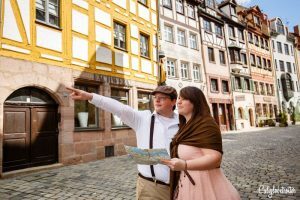 They turned out a bit cheesy, but we still love them as it includes another aspect of our travels: Germany & half-timbered houses which are our favorite! 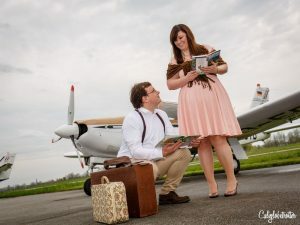 Why Should You Do Themed Engagement Pictures? While the traditional engagement pictures couples take with all those lovey-dovey, holding hands and kissing pictures are beautiful and amazing, I just figure we’re going to have a ton of those pictures on the actual wedding day. I wanted to break away from traditional lovey-dovey pictures by adding some unique spice to the pictures and have fun with it! After all, how often do you get to play dress up for pictures!? 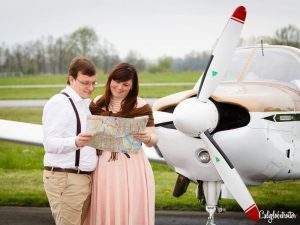 Your engagement pictures will stand out from the rest and people will be surprised or awed by your creativity instead of the standard announcements. After you’ve framed and hung your favorite photos, what to do with the rest? Well, that’s a great question, and I’ve got a great answer for you! 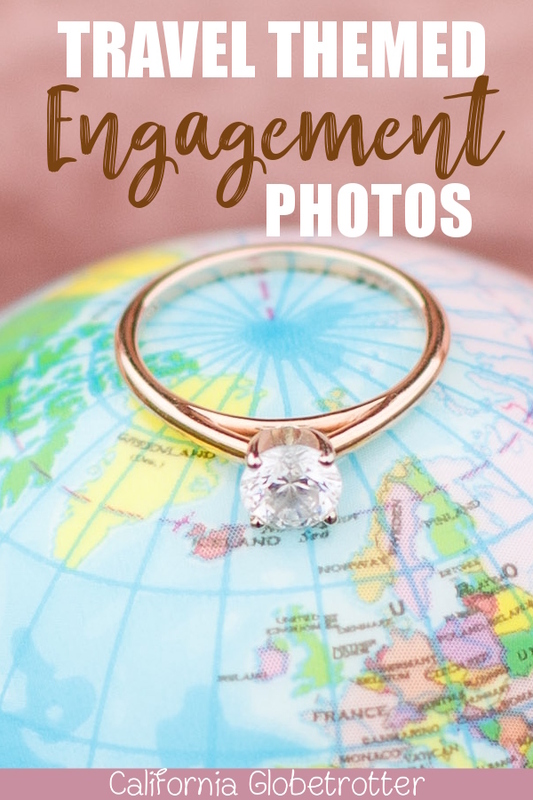 Why, turn your beautiful photos into an engagement album with Blurb! 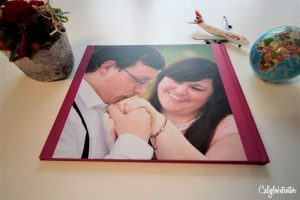 A quick and easy process to choose your photo book, upload your photos, arrange them in a beautiful way, add some text if you want and hit purchase! With the click of a button you can have the most professional looking, hard or soft cover Blurb photo book to share with your friends and family! 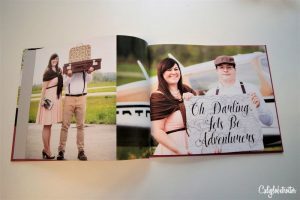 Here, I show you the hard cover image wrap on the front and back of my Blurb book, including a few pages inside to get a better glimpse of my Travel Engagement Photo Book! A HUGE thank you to our friend Andreas F. for taking our beautiful engagement pictures! Those are fabulous! Clever idea and they turned out really great! Anyway… your photos turned out amazing and this was such a clever idea. You both look great. Hope the wedding goes perfectly! Ya it’s definitely not much of a European thing, and I debated a looong time about whether or not I wanted to fully share them as I didn’t want it to come off like “oooh look at us, look at our engagement pictures”. I simply decided to share them to give others an idea for their photos. No no, and I wasn’t implying you were implying that we were implying “look at us” haha. I just just saying that’s also not what I wanted. Your outfits are well planned for the setting. Great pictures, very cute! Thanks for sharing! Thank you! It was quite a challenge to find what we were looking for! But so glad it turned out nice! Thank you! I’m so glad they turned out well! You made me want to get engaged again. These are soooo beautiful and suggestive pictures, Lolo! I particularly liked the one in which the two of you look at the map and he is pointing towards something. Wonderful ideas for engagement pictures. Thank you so much! It was quite fun to play around in our pictures! Herzlichen Glückwunsch zur Verlobung ihr beiden 🙂 The pictures are so beautiful. How clever to give the local airport a call! I can’t wait to see the wedding pictures 😉 We didn’t do an engegament shooting, though I would have liked that a lot. Bev perfectly described my hubby, he is the perfect don’t-draw-any-attention-towards-us-American. At times I feel he should be the German and let me be the American (I like pictures, showers and all that) Haha. Love it! Best of luck on your wedding day. Engagement photos have evolved so much since I was married in the early 90s. Back then, I had a (very stylish) studio session in which we both dressed in denim shirts and denim jeans against a gray background. I know it was stylish because the Kardashians took a family photo around that time period with the exact same set up. That’s awesome! My parents also took a cool picture by the beach in denim jeans in 98! I’ll start by saying Congratulations on your upcoming wedding! I’m also getting married this year! Our date is December 3rd so I’m really hoping it isn’t too cold, but I’m from Nebraska so the weather can go either way! 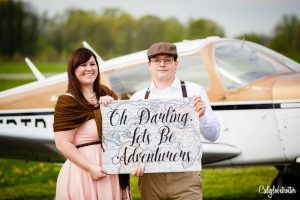 I’m so jealous of all your adventures and it is so cool you based your engagement session on it! I would love to visit Germany sometime in the near future just because of my love for it’s history and culture. Hope you have a beautiful wedding and many wonderful years to come! 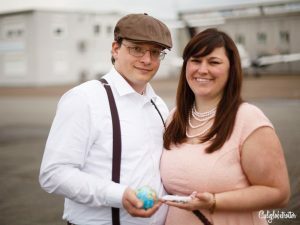 Awww I love the engagement pictures. I love vintage styles/photos/props too. 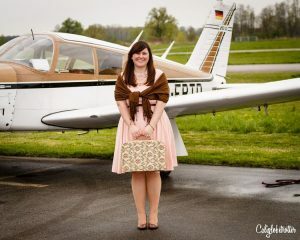 And doing the pictures with the vintage plane is SO cute! Thank you! I wanted more vintage, but it’s impossible to find brown vests here in Germany for men unless they’re black or grey 🙁 But they did come out quite nice! Thanks for stopping by!